Good afternoon! I'm sorry this post is so late in the day! I've been dealing with spreading the word about minister friends of mine that pastor in Garnett, KS. They were ministering in Wichita at a camp when they got word that their house was on fire. While the structure still stands...in the front of the house...it is likely a total loss. They lost their dog in the fire but there were no other injuries. They have 3 small children. The husband went home to deal with the situation and the wife stayed at the campground to minister. She said it was 'ordained for them to be at the camp this week and she's not leaving.' Praise God for her strength. Please join me in praying for this precious family. when your faith is tested, your endurance has a chance to grow. will be perfect and complete, needing nothing." I believe one of the hardest things to do is to be in the midst of a crisis and count it as joy! When I'm in a crisis or in some kind of 'test' I tend to be a little disoriented. How am I supposed to call it joy!! However, if we can take our eyes off the test or crisis for just a minute and remember that God is God and He knew about this long before it ever came to be, it may be a little easier to count it as joy. God doesn't allow us to be tested for His pleasure. He isn't some ogre sitting in heaven just watching us squirm. He allows us to be tested because in the test our faith grows stronger. The stronger your faith grows the better you become at sharing the Word of God with others. You become better at living the kind of life that would please God. As our faith grows, so does our ability to minister. I am praying for my friends and their children...this surely is a test and through it their faith will be increased. They know that God is in control. They know He has a plan and a purpose for them. They know God is for them and not against them. We all go through tests and trials. Don't let them get you down. Let them grow you! I know, it's easier said than done. After all, MY house didn't burn down. No, but it could just have easily been mine instead of theirs! But for the grace of God go I!! 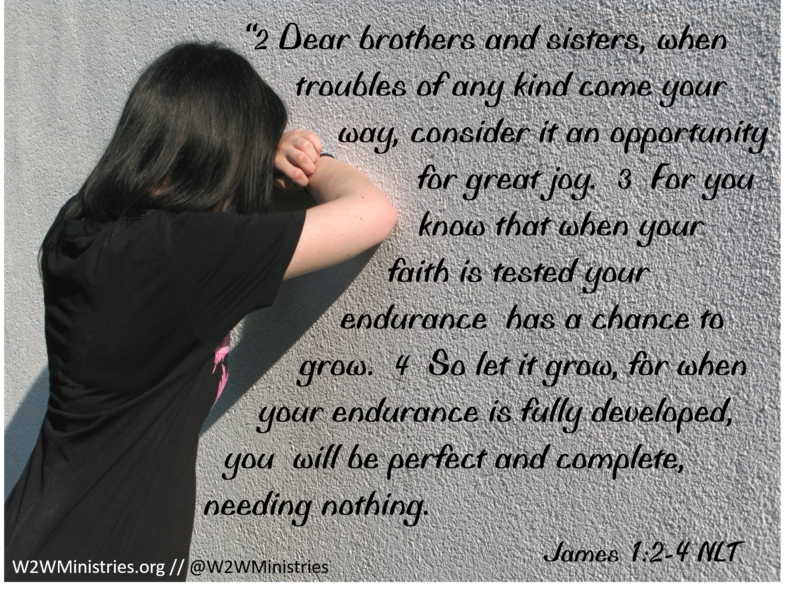 Today, I challenge you to count your trials as joy!! Have a blessed day! Praying for this family as well!